WHY LIVE OR RETIRE IN LETCHER COUNTY? We’re Appalachian, which means we’re close-knit. We know and support our neighbors. But it doesn’t mean we’re distant with outsiders. We’ll take you right in and make you one of us. We strike up conversations with each other in grocery store check-out lines. The check-out clerk will probably call us (and you) honey. We spot a license plate from far off and we’ll ask you what it’s like there. We travel, but we like coming home because it is warm and friendly. Tired of looking out your window at your neighbor’s house? Want some elbow room? There’s plenty here in Letcher County. With 217,000 acres and what the Census Bureau estimates is about 23,000 people in 2015, that’s almost ten acres per person. Even setting aside some acreage for Jefferson National Forest and state, county and local parks, you’ve still got plenty of room to breathe. Weary of paying a hundred dollars an hour for a plumber plus travel time? Good tradesmen and craftsmen cost a fraction of that in Letcher County. Food is cheaper (and we have a great grocery store that carries a lot of variety. You may not be able to find emu, but you’ll find lemon curd.) Hardware stores carry most things you need. A burgeoning farmer’s market movement is underway. As for housing, in Kentucky, just $13.14 an hour enables the earner to afford a two-bedroom rental unit. That's the second lowest in the nation. Bottom Line: While cost of living numbers vary depending on what’s counted (We’ve seen numbers for Kentucky from twenty to forty percent lower than the national average; click here for a map and drag the map until Kentucky appears. ), it’s generally agreed that Kentucky as a whole falls below the national average for cost of living, as the map shows. Furthermore, the rural areas cost less than even the low Kentucky average. Your dollars go further in Letcher County. Hate your morning commute? Tired of fighting four lanes of traffic? Abhor Beltway madness? Then try Letcher County. For us, six cars is a traffic jam and it dissolves when the light turns. You can take the time to enjoy the ride without yelling at the vehicles that are hemming you in. Because there won’t be any. And speaking of the ride, there's a lot to enjoy. In early April, the roads wind between alleys of blooming redbuds. 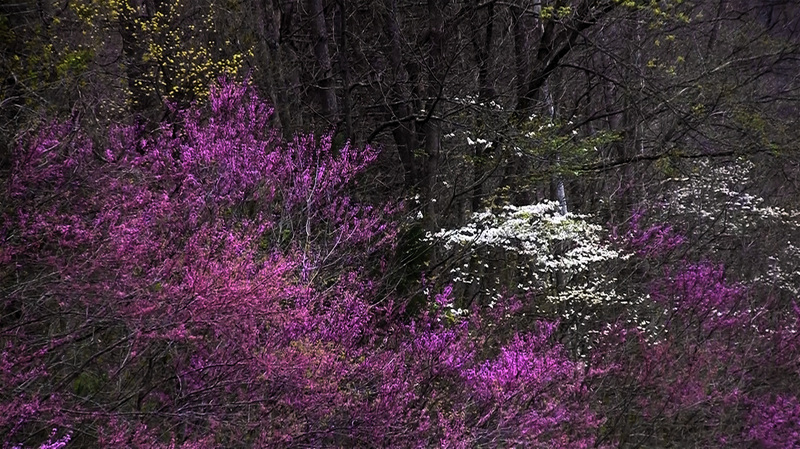 Dogwoods join the symphony during the redbuds' last melodic movement. Then summer cloaks the mountains in luxurious green, and fall turns them to orange and gold. Winter strips most of the leaves and exposes the bones of the countryside, but evergreens, birches, and oaks dotted among the bare trees hold their green, tan, and ocher colors until the new spring leaves push the old ones off, so there is never a season without color. 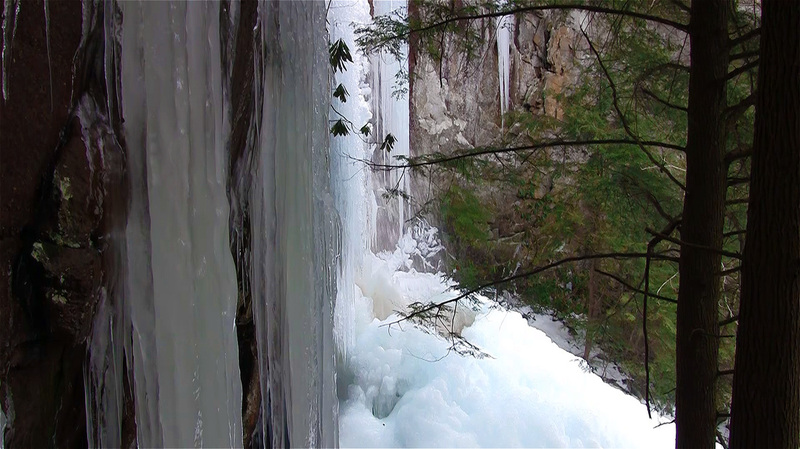 From a pure waterfall coming off Pine Mountain (beautiful at any time, but unreal after a hard freeze that solidifies the falls and layers the cliffs above it in thick cloaks of ice that fall and shatter as the weather warms, vaulting pistol cracks out above the valleys and Volkswagon-size chunks of ice down the mountain). For some of these attractions, click here. ​For reasons to establish a business in Letcher County, click here.